Why did we start using EOs and “natural” perfumes? 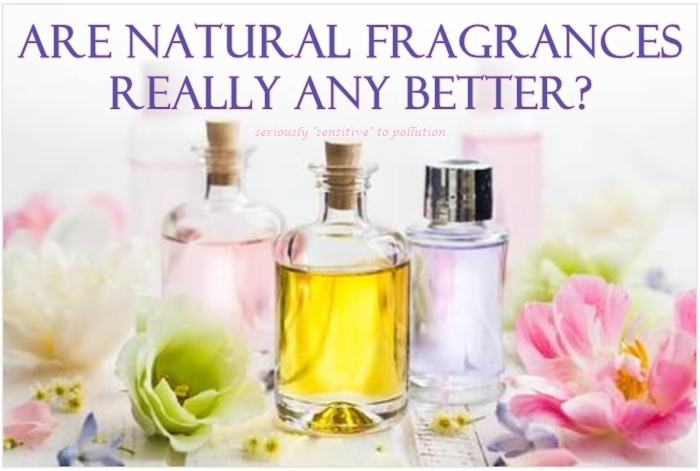 Like many, it may be because we heard that synthetic fragrances can be toxic a.f. Have you ever wondered how and why that discovery was made? It’s certainly not because of ingredient lists. Fragrance ingredients are protected under trade secret laws and do not have to be disclosed. The deeper realization that fragrances and fragranced products are harmful and toxic came about because people (most often people with Multiple Chemical Sensitivities – MCS) have been keeling over with all kinds of adverse health effects. If that wasn’t enough, people with MCS have also been subjected to years of ridicule and abuse, much of it as a result of industry generated misinformation to avoid regulation. Eventually though, a few independent researchers started digging into it. It’s quite possible that some of them wanted to prove the human canaries wrong, to prove that fragrances were ‘safe’. Instead, they’ve all discovered numerous harmful substances in fragrances and fragranced products. After the alarms started ringing, and a lot of public pressure, the industry decided to be a bit more transparent. It’s now possible to see a list of 3999 voluntarily disclosed fragrance ingredients (from 2016) on IFRA’s website. Some of those are not safe at any level of exposure. We don’t know what they aren’t disclosing. There are no laws forcing them to disclose anything. People with MCS are also known as human canaries. We’re usually way ahead of the science curve re what is and isn’t harmful to others. When you dig in, pretty well everything human canaries have ever said is harmful, has been scientifically discovered to be harmful, only that for other people the problems take longer to manifest. Non-canaries develop cancer, asthma, and other chronic health problems like heart disease and diabetes, diseases related to endocrine disruption, like thyroid problems, have trouble conceiving, and from epigenetic effects, their kids can have learning difficulties, and/or serious allergies, among other things. We canaries are now sounding the alarm that people (many people) are having numerous adverse health effects from EOs and natural fragrances. Even the pure ones, even the therapeutic grade ones, even the organic ones. And even from previously tolerated essential oils and natural fragrances. They can ALL cause adverse health effects, and some are life threatening. And it’s not just people with MCS who are adversely impacted. Now it’s people with MCAD/MCAS, allergies, autism, migraines, COPD, cancers, and many other health conditions, as well as teachers and kids in schools where they have started using diffusers and other methods of EO application. Scientists are now beginning to find other adverse health effects from EOs, including endocrine disruption and harmful cardiovascular effects on blood pressure and heart rates. Anaphylactic events from exposures are increasing. That is one of the life threatening effects, but there are others, some of which are slower to manifest. People are losing health, losing jobs, losing homes, and even being hospitalized. When someone who uses EOs or natural perfumes, (or any fragranced products) goes to a hospital, they could cause a life threatening event for someone else in the hospital, especially if that hospital has a fragrance-free policy to protect patients and staff. We canaries don’t think anyone really wants to have that on their conscience. Some people believe EOs are good medicine, well so are many other drugs, but people don’t go around forcing their drugs on everyone else around them. Why would anyone think that is it ok to inflict these personal medicines on others when any medicines can have counter-productive and harmful effects on others? Essential oils and volatile chemical products release VOCs, some of which are hazardous in and of themselves, but they also form pollutants like formaldehyde, ozone, and fine particulate matter, which not only harm the growing number of human canaries and those who are allergic, get asthma or migraines, or have autism, but create pollutants that actually harms everyone! As decent human beings, we’d use our meds privately in ways they don’t get transported in air via our skin, hair, or clothing. We won’t knowingly do things that can harm others. Can anyone really be ok with the fact that these things are even denying other people safe access to school, jobs, food, health care, etc? Because they do… and it’s not a joke. These products are simply not appropriate for public use in this day and age. Too many people have been and continue to become chemically injured and no longer able to process the natural chemicals or VOCs, and serious sensitivities and allergies are skyrocketing. Fragrance-free policies are being created to save lives. Natural perfumes and essential oils are not fragrance-free (despite what some people seem to believe). Let’s think about how what we do and use affects others, because everything we do affects others, and we can choose for these effects to be good, to reduce harm. To preserve the healing effects that plants have, and to preserve land use for food and good medicine, to reduce pollution from agriculture, manufacturing and transportation, we have to eliminate the toxic synthetics and the cosmetic use of oils and natural perfumes too. Human lives actually depend on this. It’s not necessary to add fragrance to ourselves and to everything else. But breathing clean air is necessary. Maybe some day in the future, after we get rid of all the everyday toxic chemicals in products and materials, when indoor environments are healthy, when our food system gets cleaned up, and when so many people are not chronically ill, then, maybe in 20-50 years, when we can smell a bowl of fruit again, maybe some occasional use of additional fragrance for fun might be ok… but now, our planet and living beings cannot deal with the agricultural and personal effects. We need to reduce exposures, not increase them. We need to focus on bringing things back into harmony with life, and stop putting the toxic economy first. We need to stop covering everything up with manufactured fragrance, and clean up the world instead! And why hurt anyone when we can do things that don’t hurt, but help others? It might temporarily be a bit harder, but when we shift our focus together, it will become a lot easier, and present and future generations will be thankful for it. If you don’t find them there or elsewhere on this site, then please feel free to ask. This entry was posted in Accessibility, Air Quality, Environmental Health, Fragrance, Health, Human Rights and tagged allergies, asthma, autism, cancer, chemical sensitivity, environmental sensitivities, essential oils, fragrance-free, hazardous air pollutants, hospitals, IAQ, invisible disabilities, MCS, perfume, scent, VOCs. Bookmark the permalink. “Essential oils, widely used in society, emit numerous volatile organic compounds (VOCs). Some of these VOCs are considered as potentially hazardous under federal regulations. However, essential oils are exempt from disclosure of their ingredients on their label. Thus, the public may lack information on emissions and potential hazards from essential oils. Among the 589 VOCs identified, 124 VOCs, representing 33 different VOCs, are classified as potentially hazardous. All natural and regular essential oils emitted one or more potentially hazardous VOCs, such as acetaldehyde, acetone, and ethanol. Toluene was also found in 50% of essential oils. Moreover, for the prevalent VOCs classified as potentially hazardous, no significant difference was found between regular and natural essential oils. “From the hundreds of chemicals that comprise lavender and tea tree oil, they selected for analysis eight components that are common and mandated for inclusion in the oils. Four of the tested chemicals appear in both oils: eucalyptol, 4-terpineol, dipentene/limonene and alpha-terpineol. The others were in either oil: linalyl acetate, linalool, alpha-terpinene and gamma-terpinene. Using in vitro, or test tube, experiments, the researchers applied these chemicals to human cancer cells to measure changes of estrogen receptor- and androgen receptor-target genes and transcriptional activity. All eight chemicals demonstrated varying estrogenic and/or anti-androgenic properties, with some showing high or little to no activity, the investigators reported. Ramsey said these changes were consistent with endogenous, or bodily, hormonal conditions that stimulate gynecomastia in prepubescent boys. Of further concern, according to Ramsey, is that many of the chemicals they tested appear in at least 65 other essential oils. Perfume, essential oil or cologne and their bottles are considered Household Hazardous Waste! “Please make sure that the bottle is empty and dry. The empty bottle is considered garbage since it is not the same as a pickle jar or glass juice bottle. If there is still perfume/cologne/scented oil in the bottle it is considered Household Hazardous Waste (HHW). Household hazardous waste (HHW) MUST NOT be included in your curbside garbage, recycling collection, or poured down the drain. HHW, if not disposed of properly, can be harmful to people, animals and the environment. Yes! It explains why so many people with MCS are adversely affected by cooking fumes! Also mentions the VOCs from peeling an orange setting off their meter! Once the baseline emissions for things like cooking a stir-fry or an English breakfast and mopping with Pine-Sol or a bleach-based cleaner had been established, the scientists began to layer activities together. A group of volunteers would spend the day in the house, cooking breakfast and lunch, checking their e-mail, cleaning up, making dinner, and running the dishwasher, in order to see whether, say, the emissions from frying vegetables in teriyaki sauce would react with the bleach fumes from mopping the kitchen floor afterward. Farmer told me that, based on her preliminary data, it seems as though they did, producing temporary spikes of chloramines, a class of chemicals that are known to inflame airway membranes. Another product of the marriage of bleach-based mopping and gas-burner ignition is nitryl chloride, a compound that is known to atmospheric chemists for its role in coastal smog formation. No one had expected to find it indoors. Novoselac and another Homechem researcher, Richard Corsi, recently collaborated on a separate study of nearby high schools and found that the highest emission levels were always of the same two chemicals, found in exactly the same ratio at every location. After a little bit of detective work, they identified the culprit: Axe body sprays, which the teen-age boys of Texas apparently apply lavishly in classrooms between periods. The dominant source of VOCs in Los Angeles is now emissions from consumer products, including toiletries and cleaning fluids. In other words, vehicle emissions have been controlled to such an extent that, even in the most car-clogged city in America, indoor air that has leaked outdoors may create more smog than transportation does.